The piece below with a Mayo theme was first published in the newly redesigned Mayo News on 5th August 2014 as an introduction for my new column, titled An Cailín Rua, which will be appearing every two weeks from now on in that fine publication. I’m really delighted to be working alongside such a great team for a paper of which I’ve been a big fan for a long time. My name is Anne-Marie, and I am an exile! It’s been a while since I lived in Mayo. That’s purely by design; sixteen years ago, as soon as I finished school, I packed my bags and hit the road out of Mayo as fast as my legs could carry me. Brighter lights beckoned, the world was waiting and I didn’t look back. Back then, being from a small village in North Mayo felt stifling and restrictive, with nothing to do and nothing to see. Being elsewhere meant freedom and discovery. It’s been an interesting few years. They’ve brought me around the world, through a couple of colleges, across a spectrum of employment, with a wonderful variety of people. They brought me up the walls and around the bend more than once too. I wouldn’t change much. For many of those years, Mayo felt distant. Other places started to feel like home. And while I never minded going back, I didn’t mind leaving either. It’s funny, though, as time passes how your perspective changes. (I think it’s called getting old.) After a few years living in the capital, more and more, I find myself craving the slower pace of life of the West. Now, feeling stifled and restricted means traffic jams and long hours at a desk. Freedom and discovery, on the other hand means the mountains and rivers and wide open spaces of home. Living in the capital isn’t all bad, of course. I’m one of the lucky ones. I have friends here and a decent standard of living and I’m not exactly far from home. 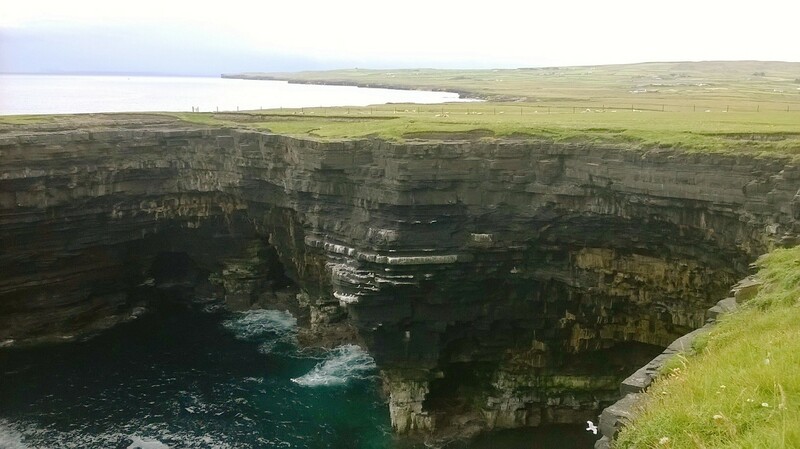 The three-hour drive from Dublin to Mayo pales in comparison to the trips home friends working abroad must endure. Friends who, out of necessity, have left their families and are working on the other side of the world to earn a living and build a future for their children. I have a decent job I enjoy with patient, understanding colleagues who tolerate my need to talk relentlessly about GAA for the first hour of every Monday. 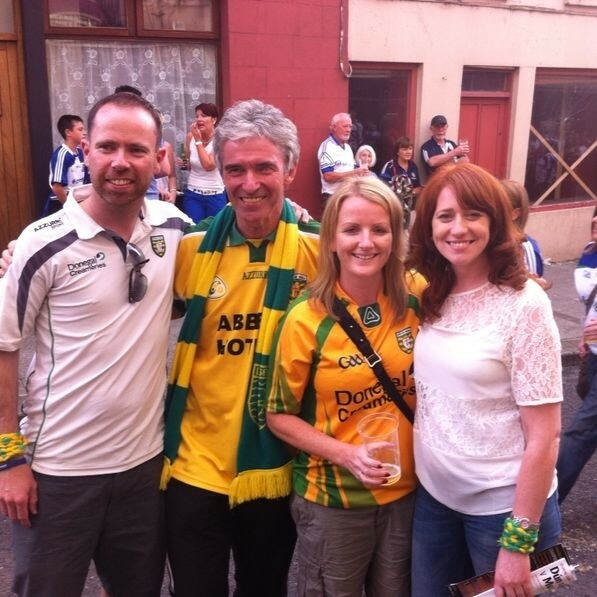 And I’m a hop, skip and a jump away from Croke Park, which comes in very handy in this glorious era of Mayo football. B&B is in demand, so book early! Technology, too, makes it so easy now to stay in touch. The internet ensures we can read the local papers, listen to the local radio, and hear the local news. It struck me the other day that I probably now know more about Mayo now than I ever did when I actually lived there. 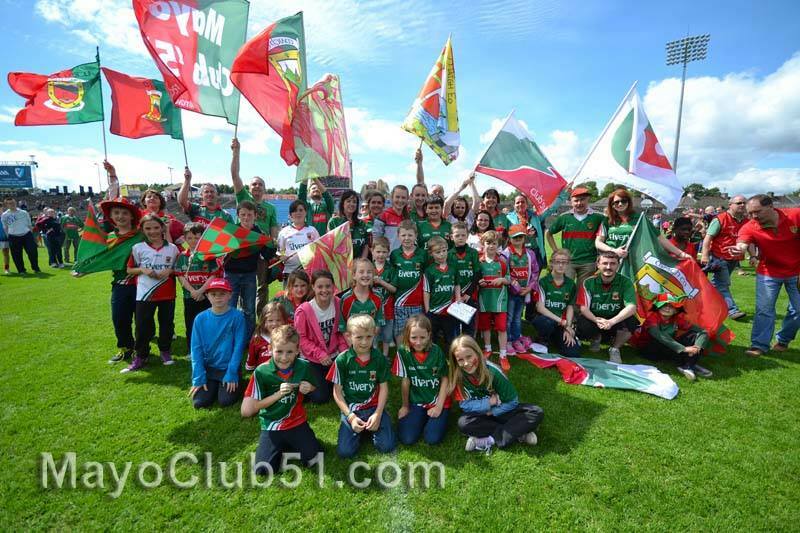 Social media makes it so much easier to be a GAA fan away from home, too – the news, chatter and gossip you’d only have heard on the street or in the pub at home fifteen years ago are now at your fingertips online, and all Mayo exiles scattered around the world, from Sligo to Saudi Arabia can join the conversation. So while you might not be at home to savour the build-up to a big game like last week’s, it’s the next best thing. So while one day I know I’ll be back for good, for now I like knowing that no matter where you go, you’re never too far away. Maybe it’s my advancing years; maybe I’m just getting sentimental. Or maybe there’s some truth in the notion that absence makes the heart grow fonder. Either way, I’ve learned over the years that there’s just no place like home. The thunder and rain woke me this morning at 5.50am, but I didn’t mind too much, because there are few things I enjoy as much as a good cleansing thunderstorm and a tropical shower. And today was Friday, a fact which in itself usually suffices to make it a happy day. Despite being bright-eyed and bushy-tailed at stupid o’clock, though, I still managed to be late for work. Go figure. Because it was lashing so hard, at lunchtime I wrote off the prospect of any outdoor activity, booked cinema tickets and was secretly happy. Naturally, that ensured that the rain stopped instantly, the sun re-emerged and it became one of the nicest, sunniest evenings of the year. (You’re welcome. Anyway, I stuck to my plans. We went to see Boyhood, which is a really lovely piece of work and well worth seeing. 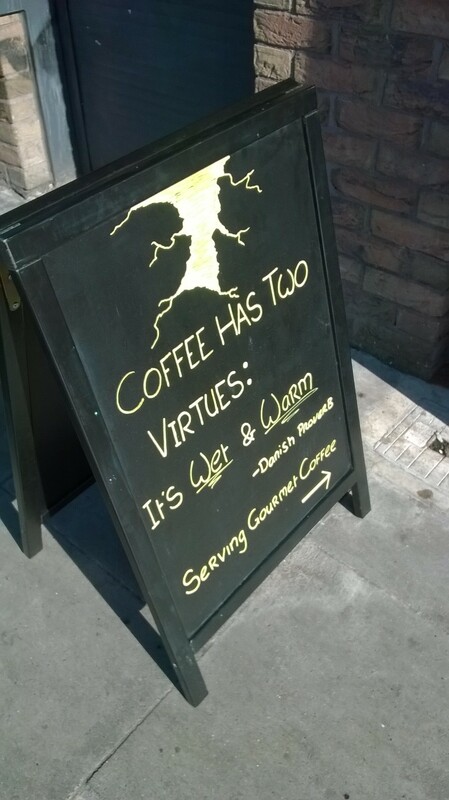 On my way to the IFI, this made me smile. Today was a normal, run of the mill day, if there is such a thing. Nothing remarkable happened in my world, and I didn’t leave my desk until 8pm. But the day wasn’t over. 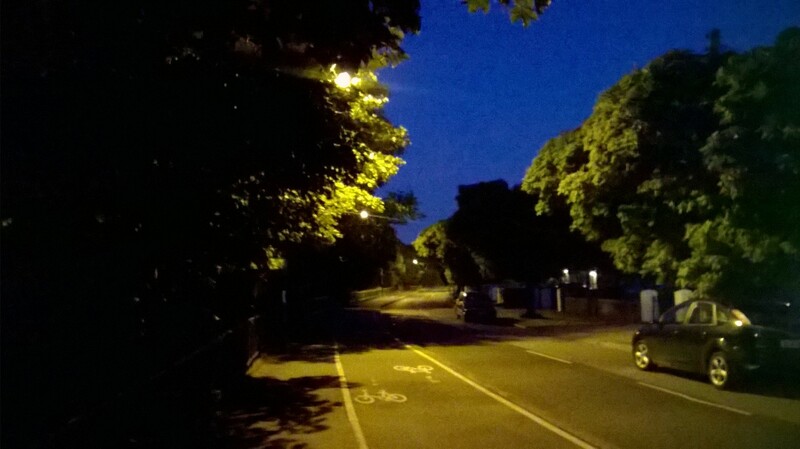 These days I find myself craving the countryside more and more, but you can’t go out for a four-mile walk by the river at 10pm in the country, even on a gorgeous summer’s night like this, and feel safe. So I guess you win this one, Dublin. Day 2 of 100. A bit daunting looking 98 days ahead, but I have just proved that I have two days’ staying power which for me, is not bad. So, full of enthusiasm for this new undertaking I spent today looking for things that might make me feel happy. By 2pm I was starting to get a bit worried that I might be dead inside. I’m not sure that this is how it’s meant to work but by 4pm, I figured if happiness wasn’t going to me, I would have to go to it. So I picked up the phone and booked a yoga class. When I first moved to Dublin and was finding my feet in a new city, with a new job, new housemates (three lovely, handsome but hopelessly and worryingly undomesticated guys), a new social life, a rather unstable relationship, an equally unstable car complete with two L-plates, yoga was what kept me between the hedges. (Metaphorically speaking, that is. Behind the wheel was another story.) Two hours, two nights a week to shut out everything and simply concentrate on not dislocating something, not falling on my face, not falling asleep during Shavasana and not farting during child’s pose (it has happened to someone, in nearly every class I have ever attended, but never me) was enough to distract me from all the pressures of the outside world. Total bliss. In a world that’s getting increasingly frantic, where it’s hard to “disconnect” or get time away from computer and phone screens, there is something very healing about shutting out the noise, concentrating only on your own breathing, using your body, and appreciating how remarkable it is. And for ten minutes at the end, you lie flat on your back with your eyes closed, slow your breathing and relax all of your muscles and take some time out to spend inside your own mind. It’s precious downtime for your brain and for your body, something we don’t always make time to give ourselves. When done, you thank yourself for that time. Which is nice. I’d fallen out of the yoga habit over the past couple of years. Last week I tried to touch my toes, only to discover that my hamstrings have apparently shrunk by about a foot and I could barely reach my knees. So tonight I took myself off , right back to the start to a beginner’s class. To my delight I managed conduct myself with relative dignity throughout and emerged relatively unscathed, having only injured myself mildly by dropping a cork block on my toe. I think that’s a success, and therefore qualifies as today’s moment of happiness. 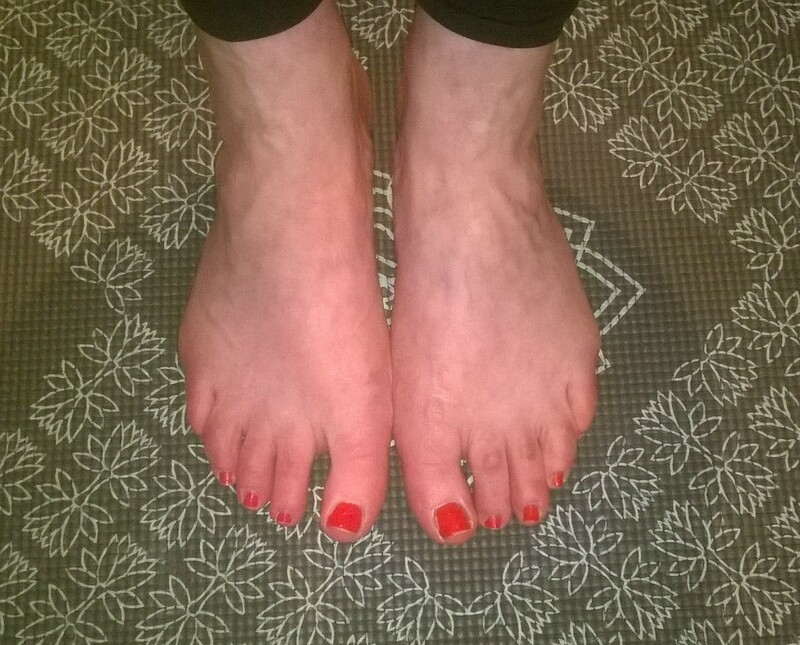 To illustrated this momentous milestone, here’s a photo of my feet on my yoga mat. I told you I was a rubbish photographer. And I apologise for making you look at my feet.